But with The Delivery Man, his new CD on Lost Highway Records, Elvis Costello has returned to territory that will be familiar to his legions of devoted fans. The album is a fiery fusion of American roots music, R&B, and punk. The songs here feel halfway between the full-on pub-rock sonic knifings of This Year’s Model and the literate, adventurous country-rock of King Of America. Those who know Costello’s amazing reimagining of “Must You Throw Dirt In My Face?” from Kojak Variety will be pleased to hear echoes of that track throughout The Delivery Man – Costello’s country music is bluesy, desperate, feisty, regretful, piteous but cut always with black humor. Lucinda Williams and Emmylou Harris make prominent appearances on the album, but this is Costello’s show – and it’s an elliptical, character-driven, referential novella of a rock and roll album. “MonkeyTo Man”, a darkly comic R&B shouter, is a highlight of the set. Costello has always been one of the great straight-song singers in rock history – a powerful interpreter and communicator who can invest an outraged humanity in the most confrontational lyrics – and here, he summons forth all the fireworks in his arsenal. Without ever degenerating into mere shouting, Costello coaxes every ounce of bewilderment, shock, and disapproval out of the witty lyric. Backed by the Imposters (the legendary Attractions with the subtle and empathetic Davey Faragher taking the place of Bruce Thomas), Costello renders his scalding performance over a skittering, propulsive, Sixties garage rock groove. 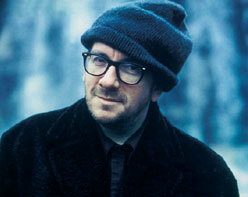 Because he’s best known for his unparalleled songwriting and singing, Elvis Costello’s videos often become afterthoughts. That shouldn’t be. Costello videos are invariably playful, kinetic, and thought-provoking – loaded with in-jokes and moments of revealing comedy – and the “Monkey To Man” clip shows that his visual inventiveness isn’t slowing down at all. If anything, he’s getting even more frantic, more energetic, and more casually hilarious. Cuts come fast and furious, images flit from shot to shot and scene to scene, and Costello – the ringmaster of this wild circus – grins at the camera like a slightly psychotic huckster. The video begins with titles that look imported from a Fifties jazz record, or perhaps a Hanna-Barbera cartoon: the monkey trial we’re about to watch, we’re told, is presented by “Scopes-I-Tone”. The faux-credits hold for a few seconds before switching to a re-creation of the This Year’s Model cover – but instead of a lascivious-looking Costello behind the tripod, we’re shown a man in a gorilla suit. The star himself appears moments later: he dances down a red-tiled hotel hall with a guitar, swinging his head to the beat, acting out lines, looking every bit the part of the legendary performer. It’s a festive set he’s part of – Costello is surrounded by balloons, jugglers, bright lights, and barefoot dancing girls in bikinis. They’re adorable, and their choreography is period-specific, too: it’s like an episode of Laugh-In, without the freeze-frames. Yet chaos continually subverts expectation. The gorillas frug assiduously, and the dancers pose like a James Bond poster. A despondent teenager, surrounded by revelry, stares at the camera accusingly. Costello fights off ape-suited musicians in a hotel bathroom. The girls tend an indoor barbecue, and apes work the baccarat table and the Vox Continental. As in Elvis Costello’s music, there’s so much going on that it’s impossible to wrap your mind around all of it in one sitting. It’s an art he’s mastered: intriguing you, drawing you into his encyclopedia of associations, compelling you to go back for a closer look.